What interesting mistakes! Let’s make everything that’s puzzling about these explicit. What on Earth does it mean that 10 isn’t equal! 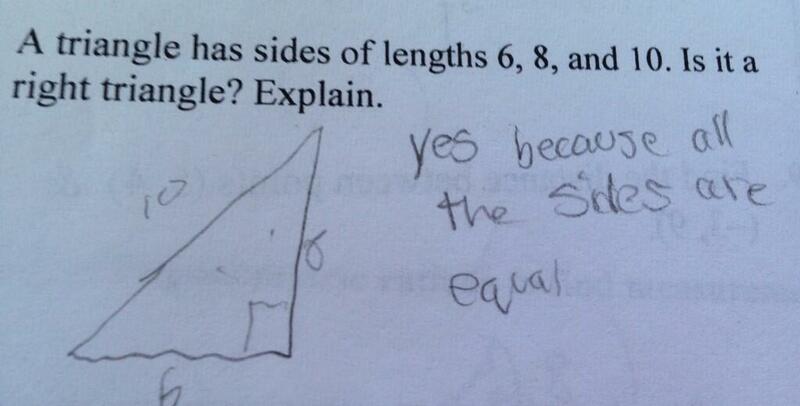 What exactly does this student think “right triangle” means? Does he think it means that all the sides are equal? How? You drew a picture showing that the triangle has sides of length 6, 8 and 10! So a right triangle needs to have all equal sides? This is mysterious to me, but what’s important is to not dismiss these students as hopelessly confused. Take the second mistake. What we’ve discovered is that you can know a lot and still think that a 6, 8, 10 triangle has all equal sides. That’s really cool! As far as shedding light on these mistakes, I’m really having trouble coming up with anything that makes sense. I’d say that the top student is not saying that 6 and 8 are equal to each other, but then what is that student saying? Posted in Pythagorean Theorem, Similarity, Right Triangles and Trigonometry.